Stella’s Honour will be hoping to claim her third victory this preparation when she steps up to 2100m for the first time in the Rating 85 event at Te Rapa tomorrow. The daughter of O’Reilly has shown glimpses of her ability in what has been an up and down campaign, but the Ballymore team is confident the best is yet to come from the mare. “She’s a black-type mare through and through, but she can be her own worst enemy,” co-trainer Chad Ormsby stated. Stella’s Honour will have three travelling companions for tomorrow’s meeting including the impressive last start winner Soul Sista who broke through for her well overdue maiden at Waipa last month. “She’s come along in leaps and bounds since Waipa, and she might just be one of those horses who finally get a win and go on with it,” Ormsby said. Soul Sista will be racing in the Rating 65 event over 1600m and will have the services of inform jockey Danielle Johnson. 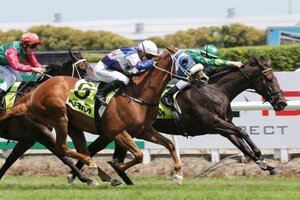 She has drawn the outside barrier, although has proven a versatile galloper in running from nearly anywhere in the field. That’s How We Roll will be having his first crack over the hurdles when he lines up in race two on the card. The son of Pentire has a task in front of him going up against some well performed jumpers, although an eye catching trial last week has given Ormsby confidence going forward. “You don’t know what to expect with first timers, but he’s done everything well and I’m looking forward to seeing what he has to offer,” Ormsby said. The last runner for the Ballymore team will be Unknown Pleasures who unfortunately is sitting on the ballot and is not likely to get a start in the Rating 75 event.